This detailed map of Washington, DC was compiled by a secret USSR mapmaking program during the Cold War. Wired published an amazing 6,000 word article on the topic, which you should read in full here. "The maps were part of one of the most ambitious cartographic enterprises ever undertaken. During the Cold War, the Soviet military mapped the entire world, parts of it down to the level of individual buildings. The Soviet maps of US and European cities have details that aren’t on domestic maps made around the same time, things like the precise width of roads, the load-bearing capacity of bridges, and the types of factories. They’re the kinds of things that would come in handy if you’re planning a tank invasion. Or an occupation." The DC map was obtained by John Davies, who first discovered the Soviet maps in Latvia in the early 2000's and runs a comprehensive website on the topic. In addition to practical details, the maps include scores of bizarre features that possess little military value. The foot trails at Arlington National Cemetery; small pools of water in the forest along the C&O canal; even the meticulously transcribed names of suburban streets. More than an occupation guide, the map was an effort to record everything that the Soviets knew about DC, what Wired described as a "Wikipedia, built on paper." According to Tony Morse, a remote sensing and geographic information systems expert, the Soviet's "cartographic paranoia compelled them to fill in as much as possible to make sure the U.S. wasn't hiding anything ... They had the time and the personnel. They did it because they could." The map does include numerous points of military interest that are absent from even present-day US maps. For example, they accurately place every reservoir and pumping station in the city, despite the fact that they are largely unmarked to this day on maps, google earth, and on the ground. The images below show the Fort Reno reservoir. They also depict military instillations around the city in a high level of detail. Scroll over to the Naval Surface Warfare Center in Bethesda and you will find that the mapmakers dutifully include small features such as fountains. At Bolling Airforce Base they show numerous runways that are also absent from US maps. 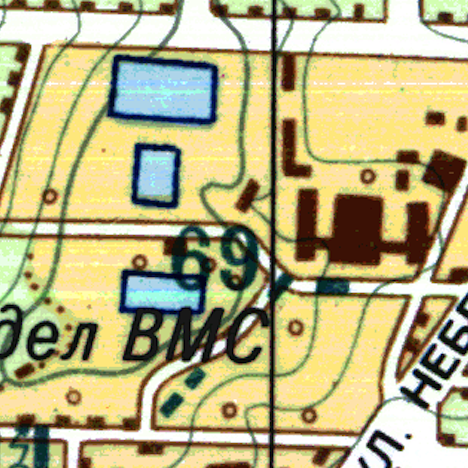 There are also some interesting omissions and errors present in the maps alongside the absurd detail. The footprints of buildings are a mishmash of fact and fiction. Public buildings in the suburbs such as elementary schools are correctly placed, while the houses on adjacent streets are all fictitious estimates. Another interesting example of this is the Rayburn House Office Building on Capitol Hill. The real building already has a weird enough shape, but the Soviet version shows an even more distorted layout. Tony Morse suggested that this could be the result of "distortions in the transfer of the building from an aerial photograph or satellite image to the map. Do that kind of work for 8 or 10 hours a day, and you get punchy." Street names on the map betray either a translation error, or a misunderstanding about English language street naming conventions. The Russian word for "street" is "ulitsa" ("улица" in Cyrillic). The mapmakers took the street names appearing on US maps and inserted "ulitsa" in front of them, without removing the English word for street from the name. An example of this is the redundant "Ulitsa Constitution Avenue". The labels on the map show a distinctly Soviet view of Washington. In translating the US governmental names and terms they frequently substituted the analogous Russian word instead of using a direct translation. Thus the House of Representatives becomes the "Palace of Representatives", mimicking the Palace of Soviets. The State Department has been transformed into the "Ministry of Foreign Affairs". A preference for the word "Aerodrome" over "Airport" produced Anacostia Aerodrome (Bolling AFB), Aerodrome Washington Virginia (Reagan National), etc. A 'points of interest' table on the map includes several mundane selections that the Soviet's deemed noteworthy. Reflecting an obsession with industry, they call out an asphalt plant, Petrolium Products Inc, Northeast Distributors Inc, Adams Fabricated Steel Corp, and several others. The maps may seem less impressive in the age of GPS and Google Maps, but they are incredibly detailed and comprehensive for the 1970s. If you enjoyed this article you might also like to read about the Geography & Maps Division at the Library of Congress, or how the Fed's old nuclear now houses an A/V archive.